Riding a skateboard or a longboard is an awesome hobby and a great way to get around, but if you are ready to take your skating to the next level, you may want to consider getting an electric board. Electric skateboards and longboards are an exciting new way to ride that offers its entirely own set of fun riding styles and challenges. Before you purchase an electric board, however, there are several factors you will want to take into account. 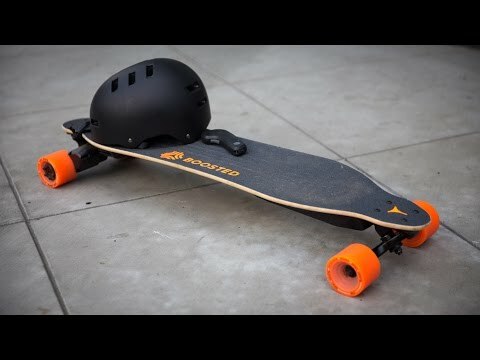 In order to help you get the best electric skateboard available, have a look at this guide to electric longboards and skateboards. While there are plenty of electric skateboards on the market, the innovative design of Yuneec E-GO helps it rise far above the competition. The E-GO is a powerful, lightweight board that would be an excellent skateboard to ride even if it didn’t have a motor. Customer reviews of the E-GO praise its battery life, power, and most frequently, its appealing, streamlined design. While most electric skateboards are outfitted with a clunky battery pack that attaches to the bottom of the board, the battery on the E-GO is sleek and slender, leading to a board that is lighter and looks more attractive than your average electric skateboard. If you are interested in maximum speed, the Boosted Dual+ is the electric skateboard for you. Outfitted with two high performance motors, the Dual+ is one of the fastest boards on the market today, able to achieve a speed of 22 mph on a flat surface. Along with being quick, the Dual+ is outfitted with a number of rider-friendly innovations such as software that allows you to effectively adjust how difficult the board is to ride and increase the board’s power as your skill-level advances. The dual drive motor system allows you to accelerate going uphill and brake going down with superb efficiency.